Packed with a 24.8-Horsepower Kubota diesel engine, it does everything you need. It is not fast but gets the job done faster then you, a couple buddies, some shovels, and a 12 pack would. Tipping the scale at just over 2400 pounds while running the standard bucket running over things or packing dirt is not a problem. The Tundra had no problem pulling it. As a 21 year old, the joystick felt natural and easy to maneuver. My father, not being used to the sensitivity of the controls, had a steeper learning curve. Sporting a 12V cigarette lighter and a cup holder large enough to hold a Route 44 Sonic Cup, I was pleasantly surprised to find the “cabin” softly padded and spacious along with more features then a used Kia. 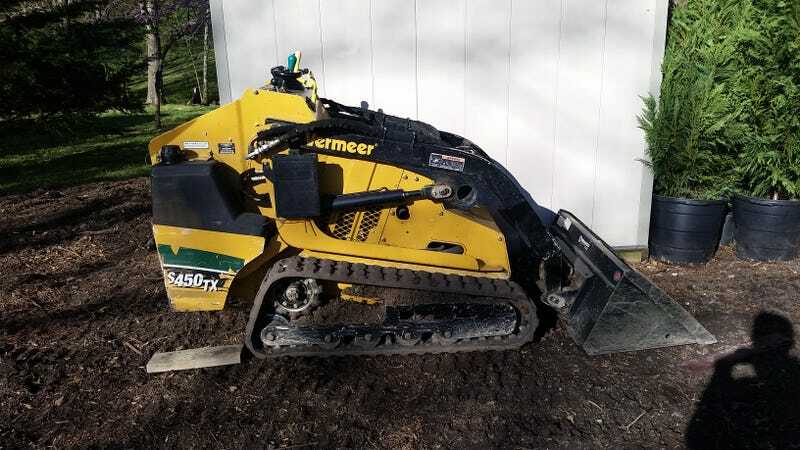 For $250, we got the Vermeer from Saturday at noon until Monday by 9 am. Not a bad deal for everything we got done. On a scale of Corolla to LF-A I give it a GX460. Versatile and not the largest, but virtually the same. While a 475 is available, it could be too large to get through narrower areas. Also, since it is around $50 more, not justifying an extra 2-3" of bucket.